In short: It’s mainly about convincing another person about something. What makes a strong PEI story for Personal Impact? The most basic ingredient for a strong “Personal Impact” example is a strong underlying conflicting interest between you and the other person. Both parties need to have a strong interest in the outcome of the situation – without this, it will never become a strong Personal Impact example, since if there is nothing at stake, it’s not difficult to convince someone. Furthermore, it’s good if your Personal Impact example is going on at least over several days, even better for weeks, since your interviewer is interested in understanding your approach to convince someone from a more strategic, and not only operational/tactical perspective, having candidates clearly laying out a strategic masterplan on how the other person could be convinced. And that’s something which usually doesn’t happen in one meeting or over night, but requires time to “design” and execute this process of convincing someone. Should I focus my whole McKinsey PEI Personal Impact example on 1 person to convince? Yes, for sure. And here is why. As soon as a third party gets involved, it’s immediately immensely more difficult to communicate your example in a structured and clear way in the very limited amount of time within the PEI. As long as only two persons are involved, it’s easy to follow the situation and know who is you and who is the other person you are trying to convince, and it’s also quite easy to follow what are your interests as opposed to the other person’s interests and concerns. As soon as you involve a third person , it’s already a triangular relationship and it’s much more difficult to follow the situation since now the interviewer needs to clearly understand what are your interests as opposed to the interests of other person A and other person B, how your interests are conflicting with those of other person A, how your interests are conflicting with other person B, how interests of other person A and other person B are going along with each other or how they are conflicting. Very very difficult to communicate such a situation in a structured way in a short period of time. 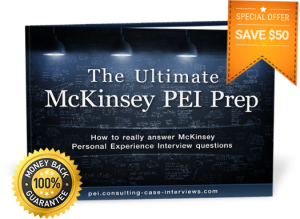 To succeed in your own McKinsey PEI, get The Ultimate McKinsey PEI Prep eBook now! Previous Previous post: McKinsey PEI – Any difference between conflict and disagreement? Next Next post: Can I pause for 60 seconds at the start of my McKinsey PEI?